A Senate committee passed a bill on Tuesday authorizing the transportation secretary to bar U.S. airlines from complying with a European Union law that would require them to pay for carbon emissions on flights to and from Europe. The measure approved by the Senate Commerce Committee will be sent to the full Senate for a vote. The 19-member panel voted to approve an updated version of a bipartisan bill authored by Republican Senator John Thune and Democratic Senator Claire McCaskill. Thune called on the Senate to pass the bill immediately to apply more pressure on the EU to stand down from what he called a misguided and unlawful tax. 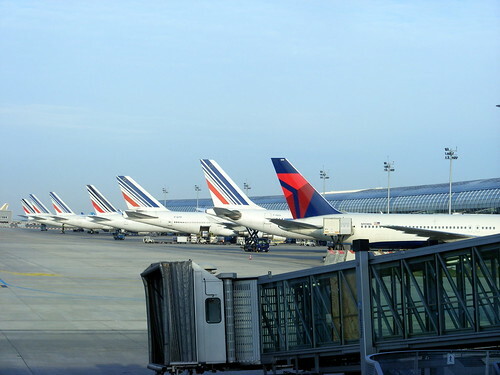 Delta and Air France planes at Paris-CDG. Photo by Mathieu Marquer. “More than $3.1 billion will be wrapped up in new taxes between 2012 and 2020 that could otherwise be invested in creating jobs and stimulating economic growth in our country,” Thune said. Democratic Senator Barbara Boxer, a long-time advocate of mandatory curbs on carbon emissions and author of several cap-and-trade bills, said she and fellow Democratic Senator John Kerry would back the measure after Thune included compromise language. Thune added compromise language that would require the secretary to hold a public hearing before implementing any ban. It would also require the secretary and other relevant transportation officials to conduct international negotiations “to pursue a worldwide approach” to address aircraft emissions. “Initially I wasn’t going to support the Thune-McCaskill bill,” Boxer told the committee, noting that she and Kerry changed their minds after negotiating the text with the Republican senator. “It (the bill) makes it clear that the place for dealing with this whole issue is an international organization that is already set up,” referring to the International Civil Aviation Organization (ICAO), she said. The U.S. Department of Transportation and State Department are hosting talks on Tuesday and Wednesday with 16 other countries that oppose the EU’s trading scheme to find a global alternative under ICAO. Annie Petsonk, international counsel at the Environmental Defense Fund, said although the bill made some compromises and encouraged international cooperation, the work of ICAO has been too slow.